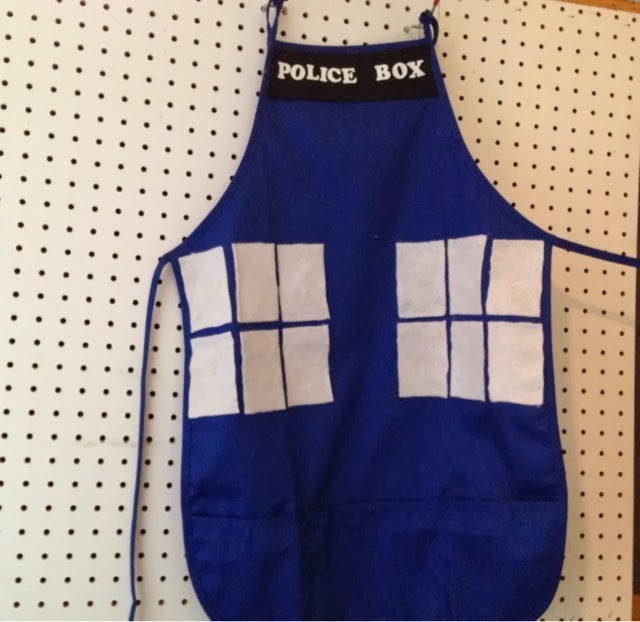 Our love of cooking and all things Doctor Who came together with this apron. I only wish it had stayed at our house. Instead, it was shipped away to Chris as part of a craft swap. The apron itself was premade. Sometimes, you just need to take a bit of help from the store! It was the perfect color and the cost was actually less than buying fabric and bias tape. The other materials (felt and iron-on flocked letters) came out of my craft stash. One of the reasons I took so much store help on this is because I've been substitute teaching so much. I'm working three days a week, usually. That probably doesn't sound like much to those of you who work. 40 hours a week and still manage a family, but having been a SAHM for so long... This transition back to the workforce needs to be slow. Not just for me, but the family. Subbing has been awesome. I've learned that not only do I enjoy teaching (when teachers leave me materials and not just busy work), I do NOT love the primary grades. Anything below third grade usually results in me needing a bps by the end of the day! High school is by fat my favorite age. And, with that knowledge, I'm going back to college to get a Masters in a Secondary Education, specializing in English. Today, I selected my classes and wow... Some of the graduate level classes seem like real snoozers... Like 17th century British poetry. I'm taking two Ed classes and American Realist Writers because I didn't really want to take advanced grammar! Why can't there be a semester long graduate class on Poe? I love to cook - I love Doctor Who - I love this Apron! You are my new apron making ideas guru. I not sure I am fully expressing how much I love your apron idea! Thank you. I so love this, how creative you are! This apron is awesome! As I explore your site, you become more and more shiny!